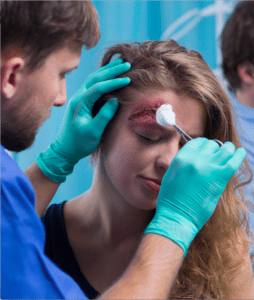 Attorneys for Scarring and Disfigurement | Simmons and Fletcher, P.C. Disfigurement has been defined by courts in Texas as an “impairment of beauty, symmetry or appearance; that which renders unsightly or deforms in some manner.” SunBridge Healthcare Corp. v. Penny, 160 S.W.3d 230, 252 (Tex.App.-Texarkana 2005, no pet.). It is a separate, recognized damage element from other intangible damage elements such as mental anguish, pain and suffering and physical impairment. Scarring is a common type of disfigurement. If you suffer one of these or a similar loss due to the negligence of another, you have a right to ask a jury to order the tortfeasor to compensate you for the disfigurement they have caused. There are several types of scars that may occur due to a personal injury. Depending upon the severity, there are a number of treatment options available. Contracture scars also known as “post-burn scars” are scars that result from the tightening of the skin due to a burn injury. It may be shallow and on the surface with a minimal effect on movement and comfort or it may run deep affecting muscle function and/or nerves and causing ongoing pain and suffering. The Shriners Hospital for Children has a burn treatment department for children that is excellent for burn care. Depending upon how severe the burn is treatment may range for cleaning the would and treating with ointments to physical therapy or even reconstructive and/or plastic surgery. Keloid scars are a raised and often somewhat discolored “puffy” area around the original wound. They area result of an abnormal healing process when the body produces an excess of collagen.The collagen fibers form in an abnormal thickness and shape causing a thick”puffy” appearance. They are really benign fibrous skin tumors. Keloids occur more common in dark skin. They can get worse and even hamper skin’s flexibility and movement when untreated. Treatment options range from ointments to scar revision surgery. Hypertrophic scars are raised areas of scar tissue on the skin and are caused by the formation of excess collagen during the wound’s healing process. They most commonly form in places where skin is tight or there is more muscle tissue such as the upper back/shoulder or chest area. Hypertrophic scars are similar to keloid scars. They often form when there is an infection in the wound as it is healing. Typically, these scars can be reduced using steroid injections or silicone sheets. Keeping the wound clean while it is healing can help prevent these scars from ever forming. Anytime someone suffers a scar or disfigurement as a result of a traumatic event, the scar, no matter how small, can have huge mental impact upon the victim. The scar itself may or may not be that noticeable to others, but the the bearer it serves as a constant reminder of a horrific event they were forced to endure. The feelings of helplessness and fear can be triggered over and over. Studies have also shown that facial scarring and disfigurement can have a lasting impact on a persons future. People are naturally drawn to attractive people. Studies have shown that people tend to be more trusting of persons without facial disfigurement than those with it. In a simple way to understand it, the victims ability to make a clean “first impression” has been impaired. This may lead to decreased opportunities both in obtaining jobs and moving up into positions of higher trust. Perceived Functional Impact of Abnormal Appearance, Rankin, Marlene, Phd. and Borah, Gregory L. M.D., Plastic and Reconstructive Surgery, Vol. 111, No.7, page 2140, June 2003. Social Judgments of Facial Deformity, Tobiasen, Joyce M. Phd., Cleft Palate Journal, Vol. 24, No. 4, page 323, Oct. 1987. Scar revision is an outpatient surgical procedure done to reduce and/or eliminate the visual effects of a scar on the human body. Plastic surgeons routinely perform scar revisions to reduce the size and/or shape of keloids, reduce the width of the scar tissue around the wound, and/or otherwise improve the appearance of scars. If you have suffered a scar due to the negligence of another, you have a right to seek recovery for the cost of not just past medical care, but also the cost of a future scar revision surgery that you plan or need to undergo. In many cases, scarring victims are minors. When a minor suffers a scar, it can be hard to tell the degree to which the child will grow out of it. Many times surgeons do not recommend performing a revision surgery on a minor if it can be avoided because of the chance that it will be minimized naturally with the aging process. Often, however, you can get a plastic surgeon to provide an estimate of what he believes the cost is more likely than not to cost once the child turns 18. It is important to take this estimate and future cost into account in settling a case involving a scar on a minor. Disfigurement and scarring are very serious injuries with permanent, lasting effects. We aggressively pursue these types of damage claims. But you need more than just a legal advocate when you have these types of severe injuries. In addition to pursuing your legal rights against the party responsible for your scars, we can help you find the right doctors to evaluate and care for your injures and obtain funding to get the care. Since the 1970’s, our injury attorneys have helped numerous clients find the right orthopedic surgeons, physical therapists, plastic surgeons and psychological counselors to evaluate and treat disfigurement injuries and their lasting effects. Call us for a free no obligation consultation.